Add some contemporary elegance to your home with the chic Florence dining chair. Finished with a durable and easy-to-clean 100% polyester fabric cover, this comfortable upholstered chair has a rich, velvety feel that adds a sophisticated twist to your dining space. Traditional tufted accents on the seatback are a handsome complement to the gently rolled top and clear acrylic legs bring a modern feel with standout style. The light and airy neutral grey colour fashionably updates dining rooms and blends easily with any existing dicor. Group multiple Florence dining chairs around a table to create an elegant dining set, place individually around your home as accent pieces, or use for extra seating when entertaining. Enhance your dining area with this set of two sophisticated Alexis Dining Chairs. Sleek and stylish, these dining chairs feature a comfortable rounded back and arms with zigzag stitching for a chic visual element. Designed to impress, the vintage brown dining chairs offer contemporary flair that easily fits with both traditional and modern dicor styles. Made to last, they have sturdy painted black steel frames and premium faux leather fabric covers for long-lasting durability that stands the test of time. Create a space that your family will love with the addition of these impressive Alexis Dining Chairs. 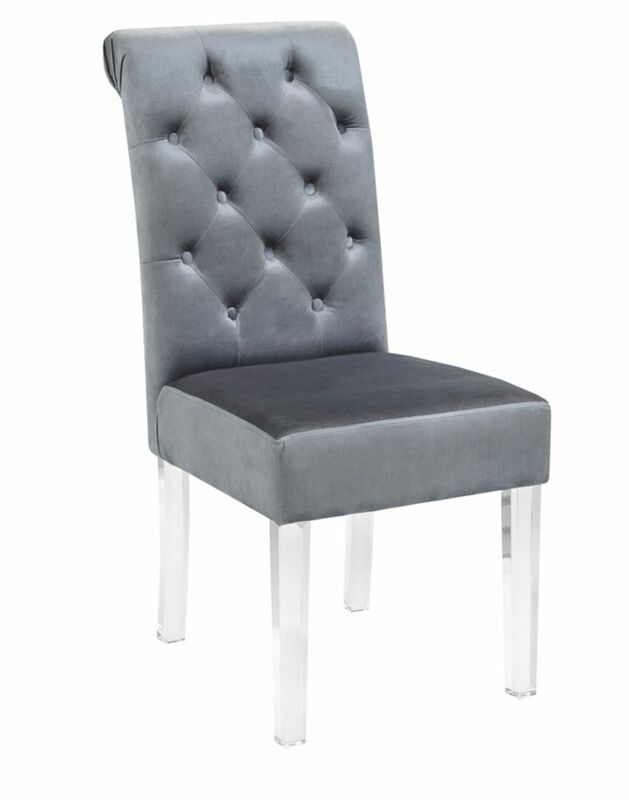 Florence Dining Chair (Set of 2) Grey Add some contemporary elegance to your home with the chic Florence dining chair. Finished with a durable and easy-to-clean 100% polyester fabric cover, this comfortable upholstered chair has a rich, velvety feel that adds a sophisticated twist to your dining space. Traditional tufted accents on the seatback are a handsome complement to the gently rolled top and clear acrylic legs bring a modern feel with standout style. The light and airy neutral grey colour fashionably updates dining rooms and blends easily with any existing dicor. Group multiple Florence dining chairs around a table to create an elegant dining set, place individually around your home as accent pieces, or use for extra seating when entertaining.